The state government will ensure effective implementation of the newly launched ‘Prime Minister Kisan Samman Nidhi Yojana’ in the state by launching a special drive to identify beneficiaries. 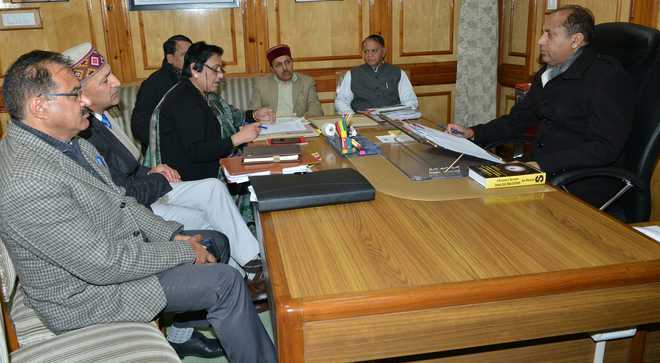 Chief Minister Jai Ram Thakur stated this while presiding over a meeting for successful implementation of the scheme on Monday. He observed that camps must be organised at the panchayat and block levels to ensure that the data could be uploaded in the Prime Minister Kisan Samman Nidhi Yojana portal before 25th of this month. He directed officers to ensure that this task was accomplished in a campaign mode at the district and block levels for its effective implementation. This will enable the beneficiaries to get first instalment under the scheme from December 1, 2018 in the current financial year. The Chief Minister said it was a Centrally sponsored scheme and as per the operational guidelines database, Pradhan Mantri Fasal Bima Yojana, soil and health cards, socio-economic and caste census could also be utilised for this purpose. He said as per the agriculture Census of the state, the number of small and marginal farmers was 8.85 lakh.